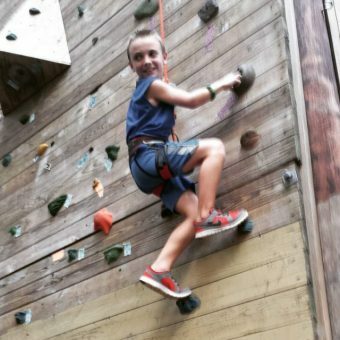 Climb on our 1,200 square foot rock climbing facility, located near Carolina Bay on Price Ave. Our instructor is fully trained and will ensure a safe and enjoyable experience. Climbing routes have been designed for beginner/experienced climbers. Group rentals are available. Ages: 3 and up. Drop-In Climbing Sessions: Wednesdays, 6:00pm – 8:00pm. All participants must sign a climbing wall waiver. Waiver must be signed by a parent/guardian for those under the age of 18. Due to the nature of this activity, the climbing wall may be closed due to inclement weather. Call 642-7631 for availability and reservations. Cost: $6 daily or $25 per 5-visit pass for City Residents and members. $9 daily or $35 per 5-visit pass for Non-City Residents. Payments must be made at the Weeks Center front desk before climbing.